Be the first to share your favorite memory, photo or story of Norene . This memorial page is dedicated for family, friends and future generations to celebrate the life of their loved one. 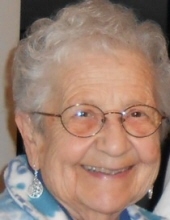 Norene Dora Blackwell (Geno) age 92 of Lapeer, formerly of Ortonville and Troy, passed away peacefully into the arms of the Lord April 8, 2019 with her family at her side. She is now reunited with her beloved husband and soul mate of nearly 70 years, Ralph. Norene was born to parents James Malvin Geno and Dora Geno on November 27, 1926 in Pontiac MI, the youngest of three children. She grew up in Pontiac and attended Pontiac schools, graduating from Pontiac High school. She married Stanley Ralph Blackwell on May 21, 1949. Norene is survived by her beloved and devoted daughter, Karen Gregory and son in law Jim, and her much loved grandson, Jason Younk. She also leaves behind a sister in law Thelma Davis, and two brothers in law, Bill Blackwell and Al Blackwell, several nieces and nephews and friends. She was preceded in death by her loving husband Ralph in Oct of 2018, her aforementioned parents, her brother Walter Geno, and his wife Bobbie, her sister Irene Watson and her husband Ernie, and her father and mother in law Dalton and Annie Blackwell. Norene was a sweet, easy going person. When someone teased her she would comment, “It’s a good thing I’m good natured.” She had a mind of her own and was not one afraid to say “no”, but mostly she went with the flow. Her smile was seen often and she loved to talk. Her mother told her she was vaccinated with a phonograph needle! Her faith in the Lord was strong and she told me more than once, “I have always believed in Jesus”. She loved hugs and kisses from those she loved. Norene loved the outdoors and nature, mushroom picking in the Spring at their St. Helen cabin, picking asparagus in the fields, wildflowers in the woods, and picking up hickory nuts, walnuts and butternuts in the Fall and saving Fall leaves. She liked feeding and watching the birds. She enjoyed crafts and going to craft shows. She made sewing projects, took cake decorating class, made her own Christmas ornaments, beautiful handmade baskets, pillows and looked for more ideas in magazines. She liked living in the country and later in life, at the lake home in Ortonville. Pontoon cruising was a favorite, and just hanging out on the deck or beach. She and Ralph traveled and spent winters in Florida for many years and they both thoroughly enjoyed that lifestyle. She loved dogs, and had several over the years. She also liked to bake and cook, and collected recipes to try out. Ralph never went hungry! She took pride in her home and deeply loved her family. She was an avid deer hunter and pheasant hunter in her younger years, going with her Dad and brother and later Ralph and family. She was quite successful and was a good shot. She went pheasant hunting with Ralph early in their dating years and shot one before he could raise his gun, he said “I just had to marry her after that!” She liked bowling and was on a few ladies leagues and couples leagues with Ralph as well. She was very involved with Karen’s schools, was a PTA mom and a room mom baking cookies and cupcakes for class parties. She was the librarian for Karen’s elementary school 6th grade class, befriending teachers and the kids in the class. She liked working on election day at the local voting precinct. She enjoyed canning and freezing veggies and fruit from the garden, and took care of her father after her mother passed away in the late 1950’s. He lived with Norene and her family for 13 years, she loved every minute of it. Norene worked for few years at GM in the payroll department as a keypunch operator and at Buhl sons in Detroit. Norene met Ralph through a co worker at GM who was Ralph’s neighbor and set them up on a blind date in 1947. The rest is history. Norene’s sweet smile and love of hugs and kisses will be missed forever! A big “Thank you! !” To all who showed Norene tender loving kindness and care at Suncrest for nearly 5 years. You are all angels of mercy. She & Ralph loved and appreciated all of you. In keeping with Norene’s wishes there will be no services. Those who wish to make a donation in memory of Norene may do so to Lapeer County Medical Care Facility Auxillary ( Suncrest) https://www.lcmcf.org/auxillary-donations Or Leader Dogs for the Blind https://www.leaderdog.org/donate/ Please feel free to share memories and condolences at www.Lynchsonslapeer.com Happy reunion Mom and Dad!! Til we meet again! "Email Address" would like to share the life celebration of Norene Dora Blackwell. Click on the "link" to go to share a favorite memory or leave a condolence message for the family.